In 1999, AOR introduced the world's first pure R(+) lipoic acid based on the most current research. 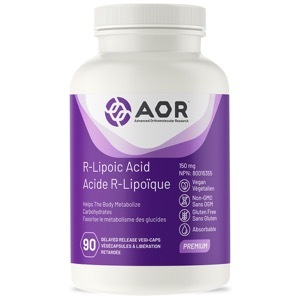 Unlike most conventional alpha-lipoic acid supplements, AOR's 95% pure R( α ) lipoic acid delivers the most effective form of this valuable antioxidant without the negative actions of S(-) lipoic acid. Primary Uses: This powerful anti-aging nutrient has been shown to mimic some of the effects of caloric restriction, the only proven method of extending health span and lifespan. It does so by protecting the mitochondria against free radical damage. A study in a short-lived strain of mice demonstrated that R-lipoic acid can dramatically increase its lifespan. Neither S-lipoic acid nor conventional alpha-lipoic acid had any significant effect. R-Lipoic acid is a versatile antioxidant known for its ability to protect the brain and nerve cells from free radicals and heavy metals such as iron that have been linked to cognitive and neurodegenerative diseases. Secondary Uses: Lipoic acid has also been shown to help reduce blood sugar levels, protect against nerve damage resulting from hyperglycemia (neuropathy) and support weight loss in higher doses. R-Lipoic acid is a powerful, natural and well-rounded antioxidant for those looking for “fountain-of-youth” supplements that also help protect the brain, nerves and metabolic health. Regular doses of lipoic acid are recommended for maintaining overall general health while high doses of R(+) lipoic acid are recommended for the management of high blood sugar, diabetic neuropathy and weight. Take 1 capsule three times daily with/without food, or as directed by a qualified health care practitioner. FASEB J. 1999 Feb; 13(2): 411-8. Antioxid Redox Signal. 2000 Fall; 2(3): 473-83. Brain Res. 2000 Feb 14; 855(2): 292-7. Am J Physiol. 1997 Jul; 273(1 Pt 1): E185-91. AGE. 1999 Jul; 22(3): 121(Abs 19).